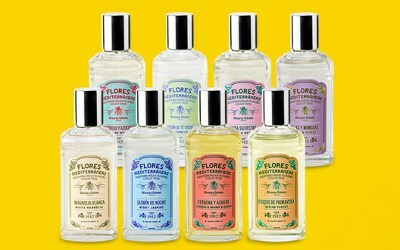 Alvarez Gomez has launched Flores Mediterráneas, a new collection of eight fragrances inspired by plants of the Mediterranean. Bosque de Primavera / Spring Forest ~ 'A journey of the senses to the forests in spring', with bergamot, mandarin, lemon, rose, jasmine, orange blossom, patchouli, amber, caraway and cedar. Jardín de Té Verde / Green Tea Camellia Garden ~ 'fresh and cheerful', with bergamot, mint, rhubarb, orange peel, lemon, musk, jasmine, amber, camellias, oak moss, caraway and musk. Jazmín de Noche / Night Jasmine ~ With lemon, neroli, jasmine, iris, lily of the valley, musk, orange blossom and amber. Lilas y Mimosas / Lilac & Mimosa ~ 'the perfume of elegance' with neroli, lilac, lily, mimosa, lily of the valley, jasmine and musk. Magnolia Blanca / White Magnolia ~ 'Fresh and sweetly scented', with citrus, orange blossom, magnolia, petitgrain, musk and amber. Orquídeas y Azucenas / Orchid and White Lily ~ 'soft and enveloping', with bergamot, peony, jasmine, orchid, heliotrope, musk, sea lily and amber. Rosa Silvestre / Wild Rose ~ 'Elegant and seductive', with bergamot, violet, orange blossom, rose, lily of the valley, jasmine, musk, white flowers and cedar. Verbena y Azahar / Verbena & Orange Blossom ~ 'invigorating and refreshing', with lemon, lime, orange, tangerine, verbena, thyme, ginger and musk. Alvarez Gomez Flores Mediterráneas fragrances are available in 80 ml Eau de Toilette. I love those bottles! And at that price point, I can certainly see picking up one of these this summer. It’s a nice summer citrus! Can you not find AG locally? It would be nicer to buy it in Spain anyway!